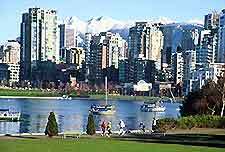 Vancouver is a diverse city with an eclectic community made up of various ethnic groups and residents from differing cultural backgrounds. The districts and neighborhoods in Vancouver reflect this diversity and offer visitors to Vancouver some wonderful nooks and crannies in which to discover traditional life. The local districts throughout Vancouver contain many unusual niches and trends set by some of the cities most fashionable characters. 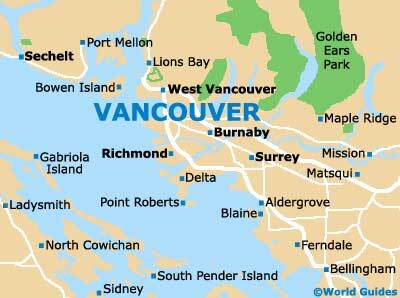 Here are Vancouver's main districts, neighborhoods and locations. 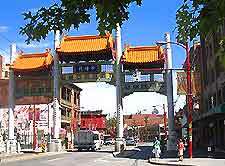 As North America's second largest Chinatown, this Vancouver district is a thriving Oriental area based around Pender and Keefer Streets, between Carrall and Gore. Here you will find authentic traditional Chinese shops, markets and restaurants, as well as a number of modern Chinese businesses. After trying some of the fantastic local dim sum, take a trip to Vancouver's Dr. Sun Yat-Sen Garden and experience an impressive Ming Dynasty-style Chinese garden. Commercial Drive is an ethnic area in which Vancouver residents with Spanish, Portuguese, Italian and Latin American origins run traditional businesses including restaurants, shops, bars and bakeries. The area is known locally as Little Italy. 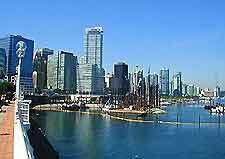 Downtown Vancouver is the city's commercial epicenter and also the area in which many of the best hotels, shopping centers and entertainment venues can be found. Cultural centers such as the Canadian Craft Museum and the stately Vancouver Art Gallery can be found on the north side of Georgia Street, while at the eastern end are a variety of theaters. Gastown is the city's historic district, renowned for its aesthetically pleasing late-Victorian architecture. The district is currently undergoing restoration and many of the classical old buildings are being transformed into modern offices or living spaces. 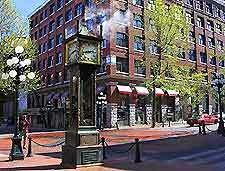 Vancouver's Gastown Steam Clock is one of the area's most notable features, with its distinctive hourly chimes that can be heard across the district. 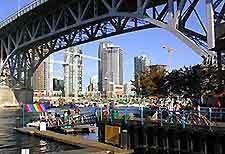 Located at the center of Vancouver city, Granville Island is a district renowned for its busy public market, which sells a wide variety of fresh produce including locally caught seafood. Converted warehouses contain craft shops, theaters and art studios, attracting trendy types and those with cultural interests. Robson Street is the city's chief shopping area, stretching from Stanley Park to BC Place Stadium. 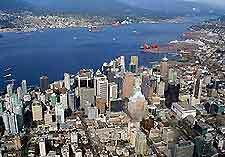 This district of Vancouver is home to a large number of fine boutiques, international restaurants and chic coffee shops, which give it its unique and vibrant ambiance. On the weekends, Robson Street a popular place to hang out and people watch or indulge in a little retail therapy. One of Vancouver's trendy districts, Yaletown is home to fashionable shops, interior design outlets, hair salons, bistros and restaurants, many of which are housed in old converted brick warehouses, giving the district a unique atmosphere.